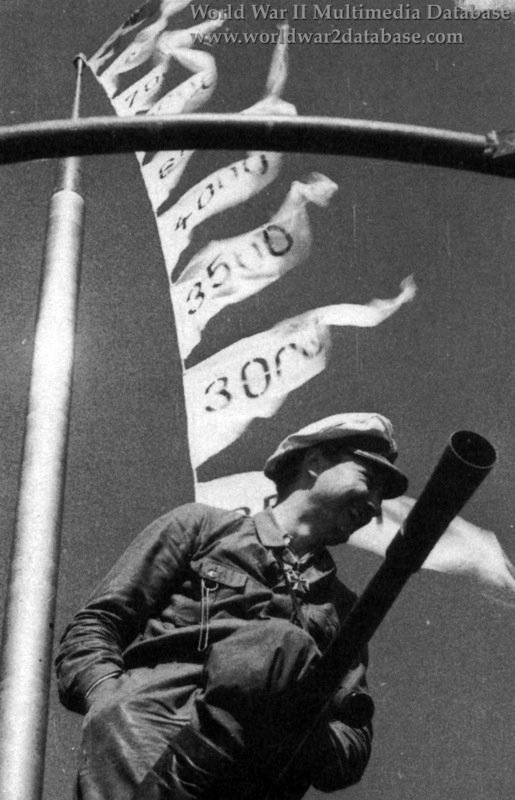 In a propaganda photo, Kapitanleutnant (later Korvettenkapitan) Johann "Jochen" Mohr (June 12, 1916 - April 2, 1943) smiles while on the deck the conning tower of U-124 with streamers with the tonnage for the ships he sunk fluttering in the background. U-124 had just returned to Lorient after one of her five successful patrols. Mohr served as an officer on U-124, a Type IXb U-Boat, for his entire career and commanded her for six patrols. Under his command, U-124 sank twenty-seven ships totaling 130,000 tons; two warships totaling 6,000 tons; and damaged three more merchantmen totaling 26,000 tons. Of the 1,948 Allied crewmen on those ships, 974 died. Seven days into his sixth patrol as captain, U-124 was attacked and sunk by HMS Stonecrop (K-142) and HMS Black Swan (U-57) 300 miles (480 kilometers) off Oporto, Spain on April 2, 1943. Mohr and his entire crew of fifty-two were killed. Mohr had been promoted to Korvettenkapitan the previous day.